With me in Missouri for the Everything indedendent feature film shoot, which Henry comically, if vaguely, referred to as "a filming assignment, somewhere out of California" (yeah, I'm only starring in it...). Kat concurred Henry's pointing out my absence for the following week's show as well. With a small kitty vocalizing softly in the background throughout tonight's show, Kat introduced tonight's multiple-book author guest, folklorist researcher Thomas White, apparently not quite all of whose bio she'd written down, as she forgot an important aspect of it, and had to have Thomas feed it to her. She even concluded by welcoming Thomas to the show by calling him Geoff. Henry asked Thomas about a three mile stretch of closed road called Blue Mist Road; our own urban legend reseacher Kat had Thomas describe his investigative methods regarding distinguishing actual legends as opposed to urban legends. Kat took the show into the first break, neglecting to point out my absence, so my name remained in the evening's host list. Ceiling Cat Barbara Duncan brought us back, reporting tonight having listeners in the US, the UK, Canada, Australia, France, and Germany. CC asked about specific ghost sighting stories and the documenting thereof. 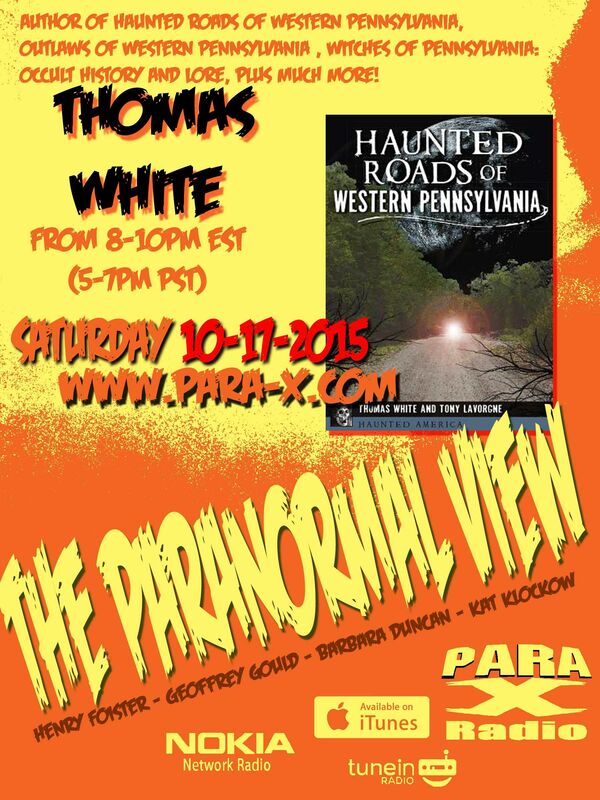 Thomas pointed out his latest book, Haunted Roads of Western Pennsylvania, essentially lists roads that have urban legends, so technically none being actually haunted. Henry pointed out in Thomas's Supernatural Lore of Pennsylvania book, there was a story called the Pig Lady of Cannelton, the sighted ghost from a murder of which Thomas described, having so many credible witnesses. At a compelling part of the story, Skype apparently dropped Thomas, Henry quickly calling him back. Once retrieved, Thomas continued the numerous legit sightings of the Pig Lady ghost. One story had a group crossing the field, and a woman fell, but mere seconds later as she stood up, she was many yards away from where she'd fallen. Another story had the ghost appear as a full body apparition to someone, saying, "Tell them 'Reno'." He told a few people who began to laugh at him until the mist began to materialize and they fled, understandably no longer laughing. With some investigating, someone with the surname Reno had been in the area at the time of the murder. It is thought the woman may have been naming her killer. Henry asked about "there's something out there in the dark," which didn't help Thomas figure out which story, or even which book to which Henry was referring. He was able to deduce Henry meant the Pennsylvania werewolf stories. Regarding the Supernatural Lore of Pennsylvania book, Henry asked about the 1956 Lost Bomber of the Monongahela story, where a B-25 flighter ran out of fuel and landed in the river. But it turned into a conspiracy story when strange men boarded the tugboat that rescued the pilot, and everyone was being ordered Not To Speak to the pilot about anything regarding the flight. Even the official documents about the flight, which is heavily redacted. Officially it was "never found," but it's well considered it was recovered by night, and covered it up. asked about Centralia, the famous abandoned town with the for-decades underground fire. Forgotten Tales of Pennsylvania Kat mistook Centralia for being based on Resident Evil movies, when in fact it was the Silent Hill films. Kat asked about Raymond Robinson the Green Man, about whose life Thomas detailed. Henry lamented they'd run out of time, particularly that he'd written on Witches of Pennsylvania. As I was not there I was not able to clarify whether the book refers to real witches or Hollywood'esque witches. Thomas also mentioned the Black Cross: the mass grave of those who died of the 1918 Spanish flu. Apart from conveying his books being on amazon (see below for links), Thomas indicated he could be looked up at the Duquesne University site. two of his books having Facebook pages: Witches of Pennsylvania on Facebook and Legends & Lore of Western Pennsylvania on Facebook, and his being on Facebook as well, but no mention as to whether he's on Twitter. With me away, Kat gave out the show's @Paraviewradio on Twitter, her own @KatKlockow Twitter account, that we can be contacted by email, the official Paranormal View page, and the show's Facebook community page. CC actually conveyed her being on Facebook and Twitter tonight. Kat suddenly realized she'd neglected to add her own stuff: her author website, her Jinxed Comic site, which also has a @jinxedcomic Twitter page, and her upcoming appearance at Rhode Island Comic Con, the weekend of November 6th-8th at the Providence, Rhode Island convention center. Kat did not give out my website, on which being my Paranormal View hub page, indicating people from there can find the show's respective report pages, nor my @realbadger Twitter, nor my being on Facebook. Henry conveyed our guest the next week would be Michael O. Varhola, author of Ghosthunting San Antonio, Austin, and Texas Hill Country, and the show wrapped out. 17 October 2015 The Paranormal View.